I was born in 1965, the Saints in 1967. I went to my 1st game in 1969. I remember watching Tom Dempsey the kick. I saw Archie looking up at the blue sky in Tulane stadium more than I’d like to remember. I saw the Dome Patrol wreak havoc on every QB that entered the Superdome. I have lived through thick and thin. I have always proudly worn my Black and Gold and proudly spoke of my team to anyone who listens. I’ve seen 13-3 and I’ve seen 1-15. I never once wore a bag on my head. I thought it was disrespectful of the team I was so passionate about. I am part of the WHO DAT NATION! A proud and dedicated bunch. I will persevere. I will bow my head in disgust today with what has happened, but I will never lose faith. I bleed Black and Gold. I always have, I always will. I am a Saint. Posted in Who Dat's | Comments Off on A re-post from Facebook. Whodatnation.com is teaming up with Real Pig BBkrew this year again to help support Hogs for the Cause. 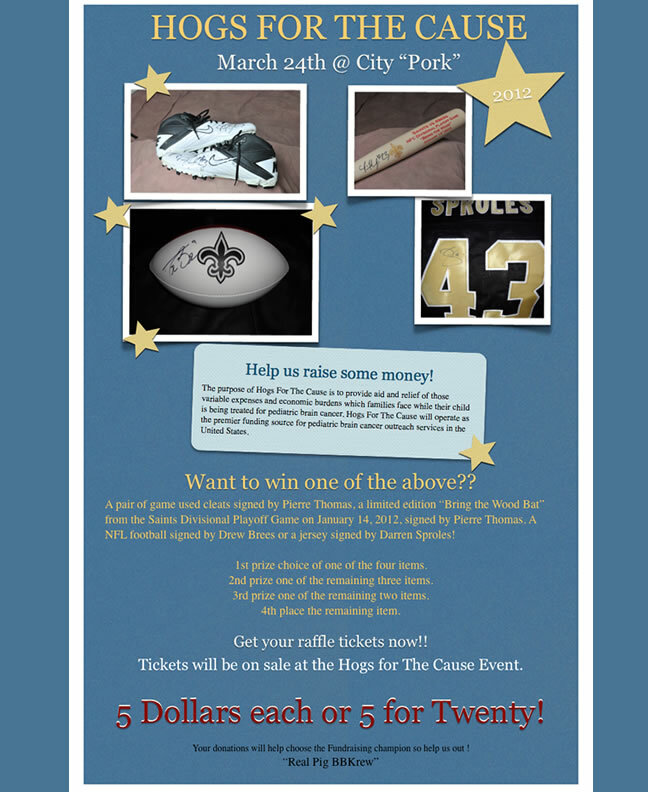 We have some GREAT items to raffle out so make sure you check out the web page to see the items.